further than Dash Builders. We are general contractors that can transform any room in your home to match this year’s leading trends. This year, for instance, we are fully equipped to handle an array of styles and designs that have become popular; just say the word. Here is just a hint of the major bathroom trends of 2018. No one should be surprised that minimalism is on this list. A style that focuses on clean lines and no fuss to create a classic look. A minimalistic bathroom focuses on the basics that are already featured in a standard bathroom: a tub and/or shower, vanity and toilet. In this case, simplicity makes the most sense, but it does not have to be boring. Cabinet hardware that sits flush against the door. 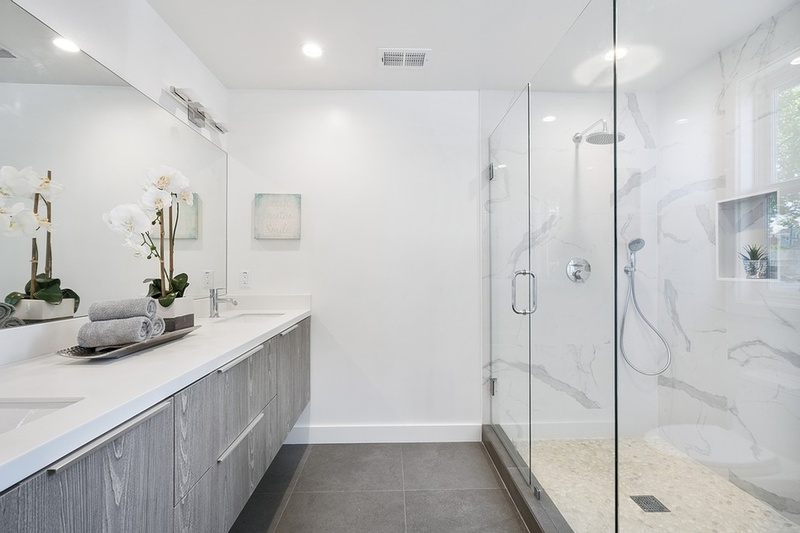 Showers with chrome fixtures, hidden drains and a glass door. Free-standing bathtubs constructed with simple, rounded lines. Minimal, and yet far from boring. Bigger is better this year in the world of bathroom tiles. Growing to a standard size of about two feet long, larger tiles with thin, almost non-existent grout lines are what consumers want. Still, in the realm of minimalist styles, larger tiles can also save you some money, since you will not need nearly as much of them. But do not fear a smaller tile! Used in-between larger tiles for an accent or along an entire wall to create a feature piece, smaller tiles should not be disregarded. The added colour or texture they give can give the bathroom that special something you did not know you needed. Or, what about the best of both world? Mixing and matching tiles of different shapes, sizes, textures and colours on different surfaces of a bathroom are definitely on trend this year. Colour will never go out of style, at least not completely. Neutral palettes can have a beautiful effect on any space, but never fear a splash of green or burgundy somewhere. Warm, earthy tones are ideal this year to create a cozy bathroom. Who would not want that? A bathroom that feels warm and inviting, the perfect place to de-stress. If an amass of colour is not your thing, then do not fret. Simply pick one earthy tone and create a monochromatic design. Sticking with different shades of that one colour can still create that cozy getaway you have always wanted. Plants and natural materials are a trend everyone can get behind. Plants in a bathroom with natural lighting will bring a tropical atmosphere. Not to mention adding colour that doesn’t have to be permanent. Bamboo flooring is another natural element that adds to a bathroom renovation. Renewable, eco-friendly and durable, bamboo floors are a great choice for any modern day bathroom. At Dash Builders, we are a company of general contractors who provide expert home improvement and renovation services in Winnipeg and surrounding areas. Experienced in all aspects of construction, from bathroom renovations to kitchens and basements, we are skilled in whatever you throw at us. We have only one goal, to exceed your expectations. We promise to build safe and high-quality rooms for every one of our customers. We build it properly so you do not have to worry. Our business is growing, and without a single dissatisfied customer, you can put your trust in us. Visit our website to request a quote at www.dashbuilders.net.